Slice tuna into little ¼ in cubes and put in a bowl. Add the rest of the ingredients, stir, and serve chilled. 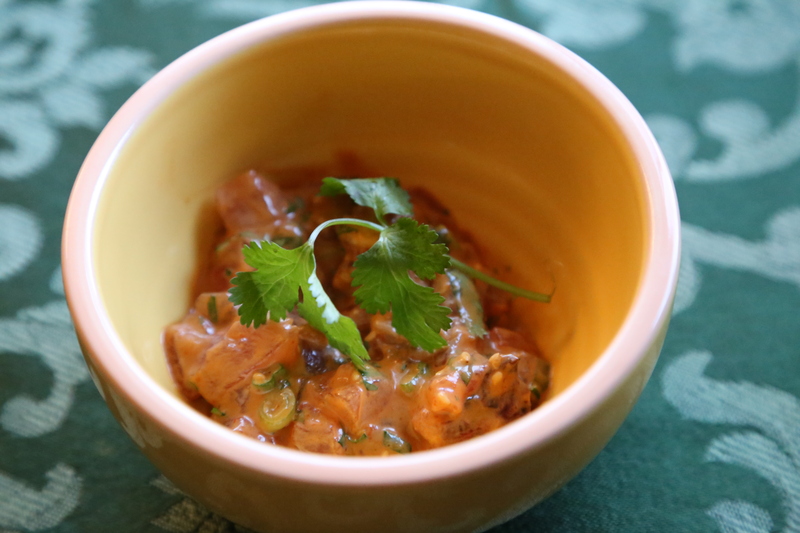 This appetizer recipe is Shawn’s go at the traditional Hawaiian dish ‘poke’. Yes, it’s raw tuna, and yes, it’s absolutely delicious if you like that kind of thing. The measurements aren’t exactly “exact,” so if you like your sushi spicy, add more Sriracha sauce, or less, whichever you prefer. A lot of the cooking Shawn and I do together is more of “a little of this and a little of that.” Anyone remember Amelia Bedelia? Yeah, like that. Now I like raw tuna. I mean, really, really raw. But then, I like my fish swimming on my plate. I’m all about sushi, but I wasn’t always. I really got a taste for it after falling in love with Houlihans’ Ahi Tuna Salad—that was before I realized that salad has over 1000 calories…a fact I didn’t know until well after my years of working there and eating it often. No wonder I gained weight even though I ran around that restaurant like a stressed out deer (obviously pre-Jenny Craig). Keep in mind tuna is very expensive. Also, you’ll be lucky to find Unagi sauce (for the poke) in a regular grocery store. I’d recommend an Asian grocery store if you have one nearby. They probably have the tuna as well, as it’s used in a lot of sushi. If you get the chance to make this, let me know! I’d love to hear what you think, especially since this appetizer is so unusual.